J did her final high school audition this morning. 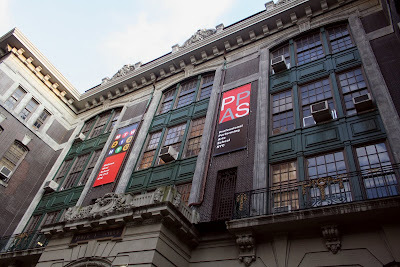 This one was for the Professional Performing Arts School. 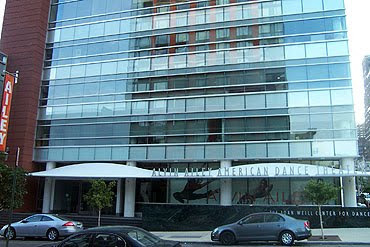 The dance audition was held at the Alvin Ailey American Dance Theater. This is also where the current students have their dance classes every day from 1:00 to 4:30. We got up around 6:30am and drove there in about 15 minutes. All the kids got a number to pin to their leotards and thankfully J was in the first group of kids. Each group had about 25 kids and there were 8 groups. There are only 26 spots for incoming dance freshman. I stayed in the waiting area chatting it up with another mom. J was done by 10am. She said there were 2 intense classes (ballet and modern) and the director asked them each a question. Callbacks are mailed to the kids in January. It was fun, she said, and then we were off to LaGuardia. It was only 10 and J's callback was for 1pm, so we had 3 hours to kill. We had coffee and bagels at Dunkin Donuts, stopped in a couple of stores, and still made the 11 block walk to LaG by 10:45. We went in, went up to the cafeteria, and met up with some dance moms from J's studio who had their first auditions there at 8am (it goes by last name and all 4 of J's friends are at the other end of the alphabet, lol). Finally at 12:30 (which took forever to come), J went up to the dance room. This time she didn't return until 4pm. She said it was harder than the first audition. She also did her 1-minute solo piece she's been working on since October. It was nervewracking having to perform in front of the 20 other callbacks, but she gave it her all. Now we wait 2-3 months. Then we'll know which high school J will be going to.